NEC Display Solutions Europe has announced the InfinityBoard, a versatile display solution designed to fulfil business demands for powerful and interactive workspaces and huddle rooms. 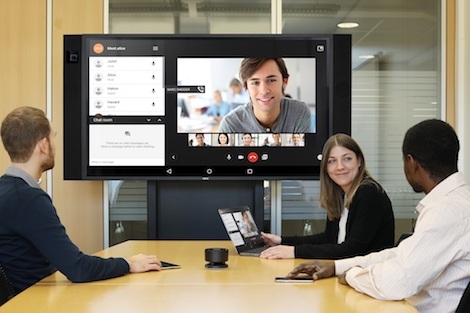 We’re told that it is suitable for video conferencing, creative brainstorming, presenting, reviewing and collaborating – the InfinityBoard provides a modular and flexible platform to enhance efficiency and productivity in all kinds of meetings. It’s based on ultra-high definition (UHD) 65” and 84” large format displays with InGlass touch technology and will be on display at #ISE2017 in Hall 5 on Stand R24. The InfinityBoard solution provides a seamless, paper-like touch performance using a passive precision pen which allows users to be creative with both finger and pen differentiation allowing for intuitive touch, interactive writing and palm erasing. The large surface allows users to create, annotate and present on an infinite canvas with the ability to import and export content thanks to the supplied whiteboard application. Using new collaboration software, the InfinityBoard supports wireless presentation, screen to device and screen to screen interaction. Using NEC’s MultiPresenter function, the solution also supports bring your own device (BYOD) initiatives, enabling users to wirelessly stream what’s on their phones, tablets or notebooks. During #ISE2017 we’ll be interviewing the people from Huddly and from Sennheiser who are instrumental in giving the InfinityBoard maximum flexibility for video conferencing; a combination of the integrated software-powered high-res Huddly camera with 120° viewing angle, the high-end loudspeakers by SEAS and an optional audio microphone conferencing solution, called TeamConnect Wireless, from Sennheiser. The modular open pluggable specification (OPS) Slot-in PC with Windows 10 operating system also makes the InfinityBoard a highly flexible solution supporting a company’s specific conferencing application and any future performance upgrades, which might be needed. The initial rollout for the InfinityBoard solution will start in the D-A-CH, the UK and the Nordic regions from May 2017 onwards. A wider EMEA wide rollout will continue from September 2017 onwards. This entry was posted on Monday, January 30th, 2017 at 13:15 @593 and is filed under DailyDOOH Update. You can follow any responses to this entry through the RSS 2.0 feed. You can leave a response, or trackback from your own site.